Takbo Para Sa Japan is a project of the Center of International Studies, University of the Philippines, Diliman, in cooperation with UP AME, UP RCY, and UP TOMO-KAI. This event is also supported by JICA and Manila Bulletin. 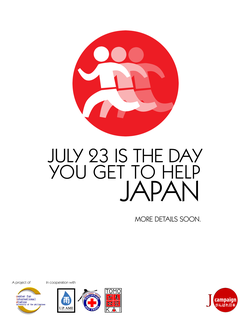 July 23 is Philippine-Japan Friendship Day. Please reserve the date and be ready to join this event! This is your chance to help the Japan earthquake, tsunami, and nuclear meltdown victims. Visit http://up-takboparasajapan.weebly.com for more details! Takbo Para Sa Japan is a project of the Center of International Studies, University of the Philippines, Diliman, in cooperation with UP AME, UP RCY, and UP TOMO-KAI.